Now a days we often see kids who are very greedy compared to how kids were few years ago. 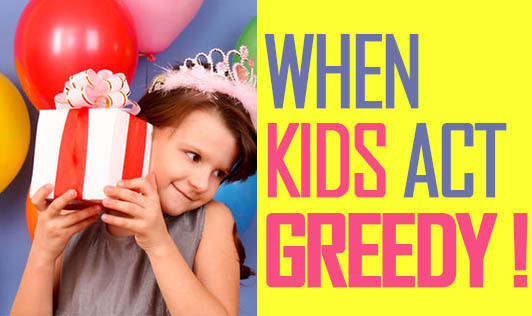 Kids seem to be very self-centered, materialistic and don't really appreciate what they have. Instead, they just want more and more even if there's an overload of toys and candy at home. It shows how consumer - driven, children have become at a very young age. Trying to match up to what their friends have, demanding the best of shoes, toys and gadgets is a trend you will notice in many children today. The biggest mistake adults make is that they oblige to their children's impulse. Motivating children with bribery is a negative style of parenting. It's important to raise kids by making them appreciate what they have as well as recognize the joy of sharing. If you have been giving in to all that your child asks for, it's time for a serious makeover. Start showing your kid what he can actually do without having more of everything. Teach him how to appreciate what he has. Denial and deprivation can be implemented for a short period of time. The main aim of doing this is to show your child that material possession is an obsession and that they can get along flawlessly with everything without having to demand for more. • Make your child earn what he or she wants. • Reward your child's positive behaviour. If he does well in what he is passionate about, like playing an instrument or drawing something, reward him emotionally. Remember that this needs to be your child's passion for it to be rewarding. • Give consequences of greedy behaviour, for example, the day your child displays greedy behaviour, don't allow him or her to play with the toys that she's not willing to share. • Teach values. Children need to know what matters most and they need to see you act on those values. • Work against the message "happiness can be bought". • Reconsider your own buying decisions; do you buy everything your child asks for just because you can? Let him or her tell you what's great about it. Show them that you're adding it to your list for his or her birthday or for another occasion. • Encourage gratitude on a daily basis. Kids should be raised in a culture that values being a good human being over acquiring materialistic things. Parents need to start correcting their kids when they show negative behaviour and teach them to appreciate what they have.